100% I'm organic. Smooth + creamy. No added salt or water. No added sugar - I contain naturally occurring sugars. No lumps or bits and nothing artificial. 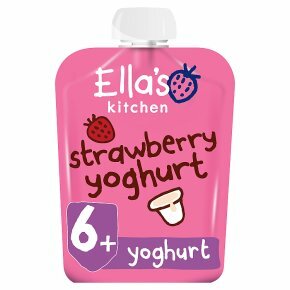 Just yummy organic fruit yoghurt for kids.Hello, I'm an organic strawberry yummy yoghurt packed full of strawberries, Greek Style Yoghurt, bananas + apples. Who am I for? My pouch contains gently pasteurised smooth + creamy yogurt so my ingredients are suitable from 6 months. The Government advises that foods containing dairy products should only be introduced into a baby's diet after 6 months. Every baby is different! Using me: Squeeze me into a bowl or straight onto a spoon. You can eat me as I am but I taste best cold. Never put my pouch in the microwave.